Do You Struggle To Make Time For Health and Fitness Because Of Your Busy Schedule? What Is The White Coat Trainer? The White Coat Trainer is a resource to teach you what you need to know to exercise, improve your diet and live a healthy lifestyle despite your busy schedule. There is a bunch of bad, contradictory and often misleading information out there. You simply do not have the time to go through it all and sort out who is credible and who isn’t. Fortunately, we have been studying this stuff for 10+ years and you can obtain all of our knowledge in a fraction of the time! We break down complex topics into simple, concise, and actionable information so that you too can take control of your fitness. As a resident physician, it is commonplace to work 80 hours a week, transition into a month of night shifts, and work 24-hour shifts multiple times a week. Despite this, we are still able to exercise, eat clean and still enjoy ourselves to the fullest. We wan’t to dispel the notion that fitness is all or nothing. You don’t have to spend countless hours in the gym, nor have a perfect diet. In the realm of fitness, something is always better than nothing. We have helped and inspired other busy individuals to start exercising, improve their fitness and their diet. The best news is, you can too. All you have to do is follow our strategies! We firmly believe that the absolute best way to teach others is to lead by example. Follow along to learn the methods that we use to maintain our fitness lifestyle. I’m Alex Robles, and the lovely lady is Brittany Robles. We both hold MD degrees and just like you, we live very busy lives. We are OBGYNs by day, and fitness enthusiasts by night. We are the first to understand that when you work 80 hours a week, it’s really difficult to find time to take care of your health and fitness. Fortunately, we have found several ways to exercise, eat healthily, and improve our lifestyle despite our demanding schedules. We have spent the last 10 years learning about health and fitness, and we want to share our knowledge and experience with you. We don’t claim to know everything, and we are always looking for new and better ways to improve ourselves. We know that you are extremely busy, and that is why we aim to present only the most valuable information. This way, you can minimize the time spent navigating through endless, contradictory, (and often misleading) fitness information out there, while maximizing your health. Below you will find our best articles, divided up by categories. Or Do You Prefer A Workout Program That Is Already Laid Out For You? This is why we created The WCT Strength Program For Busy Individuals. It it a comprehensive 15 week workout program that can be molded to fit your busy schedule. PS: It can be done in just 30 minutes per day. Or maybe you don’t want to go to a gym, or don’t have time to. No worries, that’s why we created the WCT Home Workout Program For Busy People. 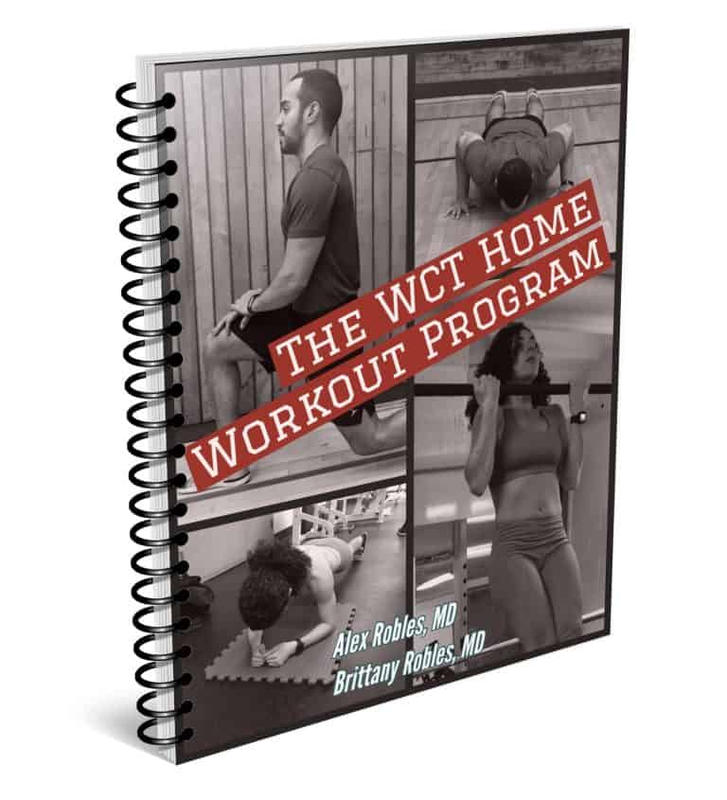 It is a comprehensive home workout guide that can be done in as little as 20-25 minutes a day. We also show you how to scale every exercise up or down so that you can challenge yourself regardless of your skill level! The best way to stay up to date with our content is to subscribe to our weekly emails. You will be alerted each time a new piece of content is published and will also have early access to any new developments. It is completely free and we will always respect your privacy! Thank you for taking the time to visit The White Coat Trainer. I understand that you are always busy, and your readership is much appreciated. I trust that you will find The White Coat Trainer a useful resource for your health and fitness. We welcome feedback, and want to know how we can help you. Please feel free to send us a question Here. We are also very active on Instagram, and you can interact with us there as well. Let Us Prescribe Your Fitness!